Revolution in personal hygiene - new generation of sanitizers! A unique silver pico particle based formula that effectively eliminates wide range of harmful germs, providing long lasting action. ● 55 ml bottle is small enough to be carried around throughout the day for instant protection. Clean hands – healthy body! Silver is a highly attractive choice for an antimicrobial agent: its toxicity to human beings is exceptionally low, but at the same time it is extremely effective broad spectrum biocide. Due to its beneficial qualities, silver has been used in different forms for thousands of years. Santegra® Hand Sanitizer Moisturizing Foam has been manufactured using the cutting edge know-how technology allowing for even distribution of silver pico particles, the smallest particles available on the market. This tecnology is a breakthrough in the use of biocidal silver. It uses a specially formed 3D matrix backbone as the carrier and distribution agent for silver pico particles, thus providing perfectly even coverage and stability. This allows to attach the silver pico particles as a thin film to any surface, providing both an immediate antimicrobial effect and a long lasting antimicrobial protection. This product does not contain colloidal silver and nano-silver, it is based on activated stabilized silver picopartilces and shows unprecedented stability that opens new horizons for usage. Santegra® Hand Sanitizer Moisturizing Foam provides immediate effect as weel as long lasting complex protection against pathogens, unlike alcohol based sanitizers, that become ineffective the moment the alcohol evaporates. Don’t forget to take Santegra® Hand Sanitizer Moisturizing Foam with you going out of the house, and use it when needed. The finest layer of silver will cover your hands with invisible pretecting gloves that will safeguard you against harmful patogens. Apply foam sparingly and rub your hands together until dry. Silver vs. alcohol. Which one is right for you? The pace of our lives is accelerating every day. Sometimes, we don't have enough time to eat, not to mention washing our hands before a meal. But we have adapted. And nowadays, a small bottle of sanitizer has become our trustworthy sidekick. It's portable and convenient to use. We buy it without even thinking about such things as proper usage, ingredients, mechanism of action, possible side effects, etc. As long as we see the magical phrase «Kills 99,99% of germs» we feel protected. But how trustworthy and reliable these sanitizers really are? How much protection can they afford us? Let's find out. There's a 9 out 10 chance, that your sanitizer is alcohol-based. So, let's talk about alcohol-based sanitizers. While being pretty effective against a variety of bacteria and viruses they are not without a few quite serious faults. 1.Dry and even cracked skin, since alcohol in such high concentrations acts as very harsh irritating solvent that strips your skin's moisture and naturally occuring oils skin needs to stay healthy. 2.People with various skin conditions can not use alcohol-based sanitizer because it makes their condition worse. 3.Doctors and nurses universally hate alcohol-based sanitizers for making their skin dry and cracked which in turn creates a very serious issue of non-compliance with hygienic regimen that leads to poor hand hygiene. According to statistics poor hand hygiene is responsible for 40% of infections transmitted in hospitals. Such infections are notoriously hard and expensive to treat and have significant mortality rate. 4.Alcohol-based sanitizers are prone to substance abuse. A lot of US schools, for example, banned use of alcohol-based sanitizers on premises for this very reason. Recently US Navy followed the suite. 5.Alcohol-based sanitizer is highly flammable and qualifies as a fire hazard. 6.For alcohol-based sanitizer to be effective you have to rub it over your skin for 20 seconds or more before alcohol evaporates. Now, ask yourself, how much time you spend rubbing your alcohol-based sanitizer over your skin, or better yet, next time you use it, time yourself. You will be surprised to find out that you are spending much less than required 20 seconds applying your sanitizer which means you are not getting protection you hoped for, not even close. But don't despair, not everything is lost! There is a solution. It is Santegra® Hand Sanitizer Moisturizing Foam. It's water based and absolutely alcohol-free. Santegra® Hand Sanitizer Moisturizing Foam is made using cutting edge know-how technology allowing for even distribution of silver pico particles, the smallest particles available on the market, that effectively eliminates wide range of harmful germs, providing long lasting action. As the name suggests, the active ingredient is silver. Hugely important and unique feature of Santegra® Hand Sanitizer Moisturizing Foam is extended residual biocidal activity, it keeps working even after being applied, even when your hands are dry. Santegra® Hand Sanitizer forms thin elastic breathable layer on the surface eliminating microbial growth and offering long term protection. 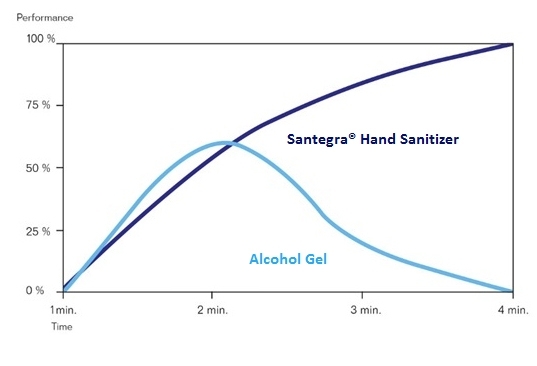 Santegra® Hand Sanitizer is not prone to substance abuse, because it's absolutely alcohol-free. It's also practically non-toxic. Thanks to Pico Silver technology the amount of silver in Santegra® Hand Sanitizer is extremely small – it's concentration's about 0,015%. Compare it with 60% alcohol concentration in alcohol based sanitizers required by US FDA standard. Santegra® Hand Sanitizer, being water based, allows protective skin oils to stay in place. Unlike alcohol based sanitizers it is suitable for repeated use and will do no harm to your skin even if your skin is damaged. Scientifical studies show that fragrances – one of the most common allergens. Santegra® Hand Sanitizer is fragrance free, so there's no risk of allergic reaction due to fragrance allergy. Santegra® Hand Sanitizer Moisturizing Foam is safe to store, because it's non-flamable. And metered pump application will help with correct and consistent dosing every time you use it.